This is a classic craft for a child to make as a gift for an adult, and this Spring themed pen and pencil pot is a great craft idea for Mother's Day! Selection of pom poms, stickers, sequins etc. First cut your cardboard tubes to size. I kept one in the original size, cut one about half size, and the third about halfway between the two. Then paint them in pastel shades of paint. Wrap a piece of craft foam around the base of the longest tube and cut to size. Then cut it out to form grass and stem shapes like below. Do the same for the other two tubes but keep the lengths of the grass shorter. When the paint has completely dried, cover the toilet roll with white PVA glue and stick the grass down firmly, leaving to dry. Secure the craft foam in place at the bottom with paper clips while it dries, and check for drips from the glue if you used a lot. Then decide how you would like the tubes to be arranged together, you'll probably want the larger tubes at the back and the smallest at the front. 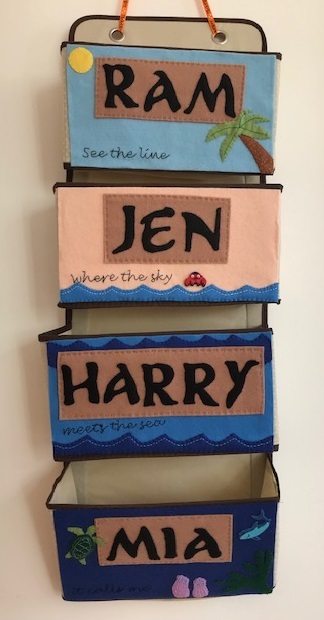 Stick them together - I've found that the best way to do this is to use a stapler with first a staple at the bottom and then again as far inside as your stapler will reach. You can also use double sided tape or more glue. 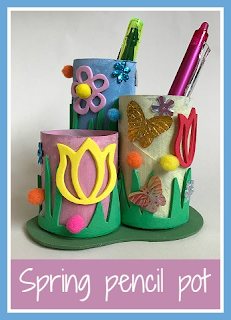 Make a base for the pencil pot using another piece of craft foam cut to size, or you can use cardboard. Glue the cardboard tubes onto the base with plenty of glue and leave to dry - if you can, try and place something heavy on the top or wedge the pencil holder in between two boxes so that it is held in position while the glue dries. When the cardboard tubes are dry, use the stickers, pom poms, sequins and other embellishments to decorate. You could even finish with a coat of sparkly glue! When it's dry, your pencil pot is ready to use! You could present it as a gift filled with some lovely pens and pencils or other stationery. Another lovely present for Mother's Day is a pom pom frame like the ones below - click to see how I made them! Mother's Day pom pom frames.